In the morning we will be transferred to the port of Piraeus to catch the local ferry to Paros. Arrival in Paros and transfer to your hotel. Rest of the day at leisure. At leisure to explore this beautiful island of the Cyclades. Discover picturesque and bustling Naoussa, explore the neighboring Antiparos, enjoy the sandy beaches, and wander in picturesque Parikia. After breakfast, transfer to the port of Paros in time to catch the local ferry to Mykonos. Arrival in Mykonos and transfer to your hotel. Rest of the day at leisure. At leisure to explore the famous island, a meeting point of the international "jet set". Discover its amazing beaches, and enjoy the unique night-life. Morning at leisure until the time to transfer to the airport. *For departures within the Greek Orthodox Easter week, please ask as itineraries may not be available or maybe altered. 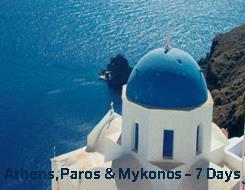 Accommodation on BB, 2 nights in Athens, 2 nights in Paros and 2 nights in Mykonos. Ferry tickets Piraeus - Paros and Paros - Mykonos with regular ferry, economy class. Anything else not specifically mentioned in the inclusions.